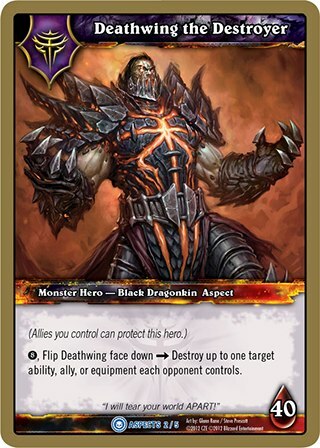 , Flip Deathwing face down >>> Destroy up to one target ability, ally, or equipment each opponent controls. BACK: When an opposing card is destroyed, Deathwing deals 3 fire damage to that card's owner's hero. Deckbuilding: You can include either [ALLIANCE] cards or [HORDE] cards, and [DEATH KNIGHT], [SHAMAN], and Neutral cards. You can't include more than one of each card.